The Boulder City boys basketball continues to play hard but is losing close games. Such was the case again Friday at home as Sunrise Mountain edged the Eagles 57-52. The loss dropped the Eagles to 1-2 in Sunrise League play. They are 5-4 overall heading into the Paloma (Calif.) Valley Winter Shootout, where they will play four games Friday through Tuesday. “The Paloma tournament always gets us a few good games during the holiday break against top competition and allows us to work on a few things,” coach John Balistere said. The Eagles resume their Sunrise League schedule Jan. 8 on the road against the league’s No. 1-ranked team, Desert Pines. 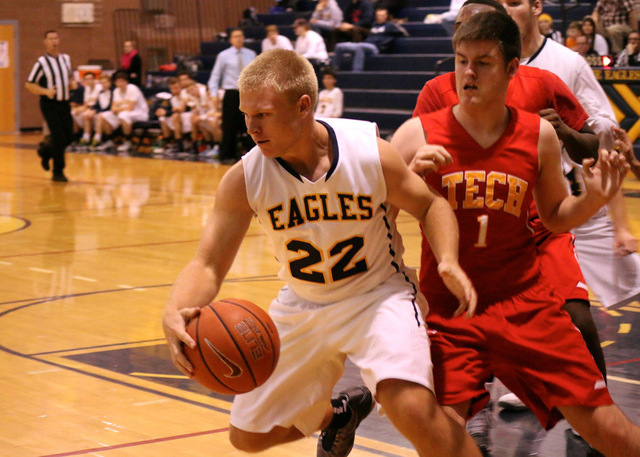 The Eagles will play their first home game after the break Jan. 9 against Moapa Valley. Friday’s game was scheduled to be played at Sunrise Mountain, but a leak in the gym roof forced the schools to switch home games. Boulder City’s home game, scheduled for Jan. 29, now will be played at Sunrise Mountain. On Dec. 17, senior guard Tyler Newby scored 12 points and made three assists to lead the host Eagles to a 47-29 league victory over Southeast Career Technical Academy. It was the Eagles’ home opener after seven road games. Zach Murphy added nine points, and Austin Wishard scored seven. The Eagles took an 11-0 lead after the first quarter and were leading 13-0 with 7:21 remaining in the second quarter before the Roadrunners scored a basket. The Eagles led 22-7 at halftime. Carmell, who helped lead the Eagles to the Division I-A playoffs, was selected All-Sunrise League first team as a safety in a voting of league coaches. He also was chosen honorable mention as a quarterback. Joining Carmell on the all-league first team are offensive tackle Jack Rozycki and linebacker Jacob Jurgschat. Carmell, Rozycki and Jurgschat also were selected to the All-Southern Region second team. Eagles named to the all-league second team were running back Logan Branscum, Jurgschat as a tight end and Rozycki as a defensive tackle. Named to the league’s honorable mention aside from Carmell were running backs Brooks Roe and Nelson Van Diest, wide receivers Zach Murphy and Austin Wishard, offensive lineman Craig Kelso, tight end Jacob Gneiting, linebacker Austin Shepard and kicker Patrick Hood. Senior libero (defensive specialist) Alyssa Ybarra, who helped lead the Lady Eagles volleyball team to the Sunrise League championship with a 13-1 record and an overall record of 24-9, was selected Division I-A All-State second-team by the Nevada volleyball coaches. She also was selected All-Southern Region first-team and All-Sunrise League first team. Outside hitter Lauren Pocius was chosen all-region and all-league first-team. Middle hitter Maggie Roe was chosen all-region second-team and all-league first-team. Teammates Jaden Wood and Emma Jeppsen were chosen all-league second-team.